Today, on the 7th January, most Viennese went back to work and all the kids went back to school. Why so late, why not on the 6th, like in the UK? The answer is because the 6th of January, which we know as Epiphany, is Three Kings’ Day here and it is a religious public holiday. The three kings can actually be seen walking around the city, taking the form of children dressed up as Casper, Melchior and Balthasar bestowing good luck on houses whose occupants open their front doors when they hear the singing three kings. The kings bless the house and in chalk write 20+C+M+B+14 over the door frame (the year 2014, with the initials of the kings in between). This is just one of the differences hiding amidst the many similarities we share in the ways we celebrate at Christmas time. Let’s start with the Christmas tree, which I prefer to put up as early in December as I can. The earliest I have managed to buy a tree here is 9th December and I put it up straight away to enjoy it for as long as possible. This, according to the locals is far too early and unusual behaviour. Trees, if they are bought a couple of weeks before Christmas, are often stored out in the cold on balconies, still all wrapped up, ready for the big reveal on the 24th. Christmas Eve, which for me from my cultural background is treated as the long day of anticipation before the big day, is the day on which Christmas is celebrated in Austria. Although shops are open in the morning, most places close around 2pm. The day time is a busy and buzzing time with lots of people out and about working, buying last minute things, or grabbing a lunch time drink with friends. Then, in the afternoon, those with children go on a small outing; the purpose of which is solely to get the children out of the house so that the parent who remains can put up and decorate the Christmas tree in record time as well as laying out all the presents. The children are brought home a few hours later by the other parent, or the helpful grandparents, and the kids return home to a wondrously festive front room and dive into their presents, which were brought not by Santa, but by the Christkind (meaning ‘Christ Child’ in English). The image of the Christkind is that of a teenage child, usually a girl with long blond hair, radiating goodness and looking suitably angelic in a flowing white gown; not your average fat Santa that’s for sure! Questions surrounding the Christkind usually occur around the same time that children who are used to another more fatherly-looking type of present deliverer start to come up. Kids start to notice that they never get to see the Christkind and realise the strange coincidence that Mum or Dad is never with them when they go out and the Christkind comes to their house. The image of Santa, or Father Christmas is present but he is called the Wiehnachtsmann (Christmas Man), and is used in many advertising campaigns and is more linked to German traditions. The familiar image of Saint Nic goes by another name, that of Nikolo or Nikolaus, and he comes to visit children much earlier, on 6th December. The familiar concept of naughty and nice children deserving or being undeserving of presents applies to this date. 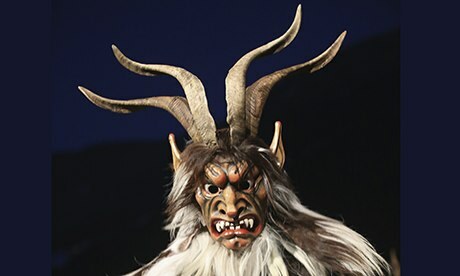 Naughty children can expect to be visited by Krampus, which is a scary looking devil type creature who comes with long branches ready to hit the naughty children with. Such unlucky children can only hope to be given a lump of coal. However, on the next day, good children are rewarded by Nikolo who treats them to nuts, tangerines and chocolates. There were lots of such treats going around the school I teach in on this day and it reminded me of how as a child as well as my small Christmas gifts, I would always be given a couple of tangerines in my stocking. Amidst the differences, it was nice to discover that everybody loves a good Christmas song, and as my classes sang along to Last Christmas it showed that, whatever the traditions, everyone loves singing along to Wham.